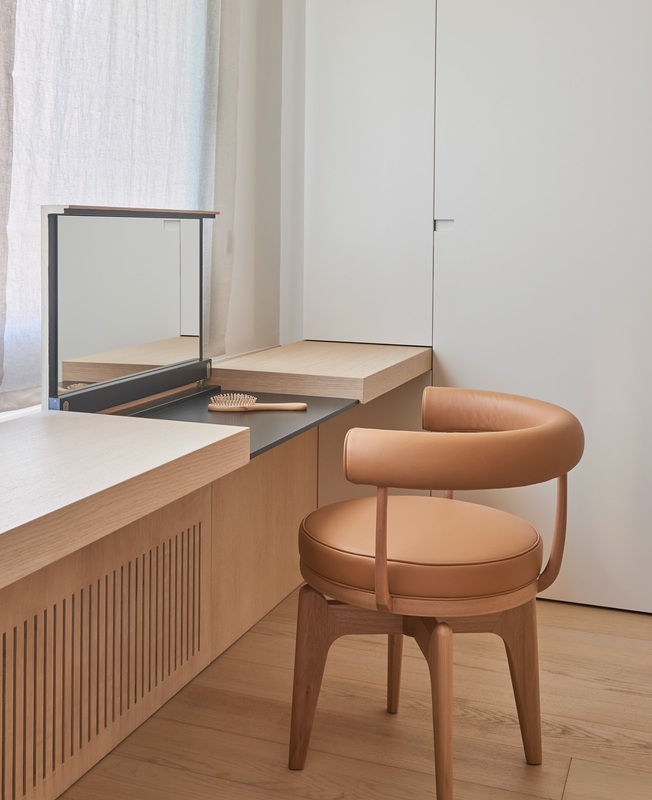 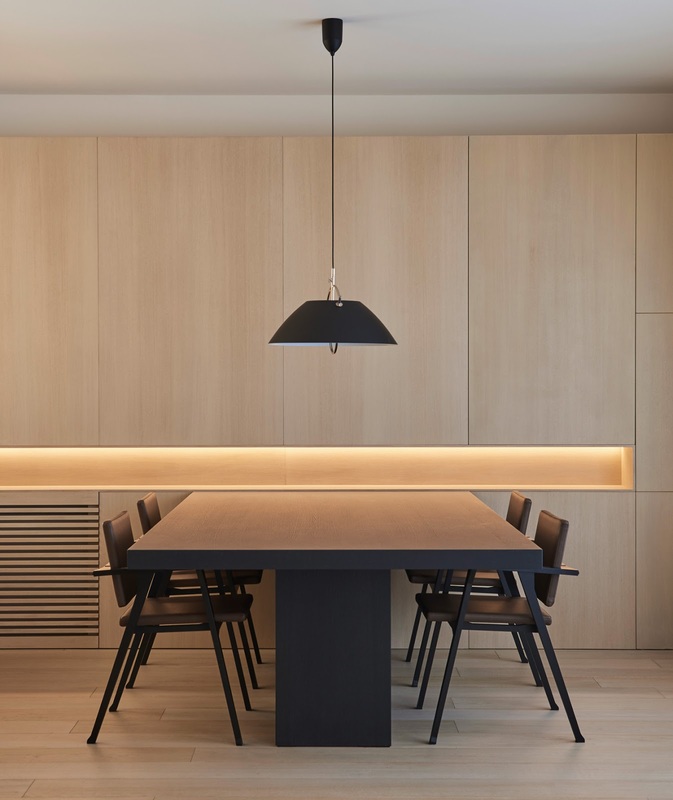 DM Apartment, designed by Francesc Rifé Studio is a minimal apartment renovation project in Barcelona, Spain. 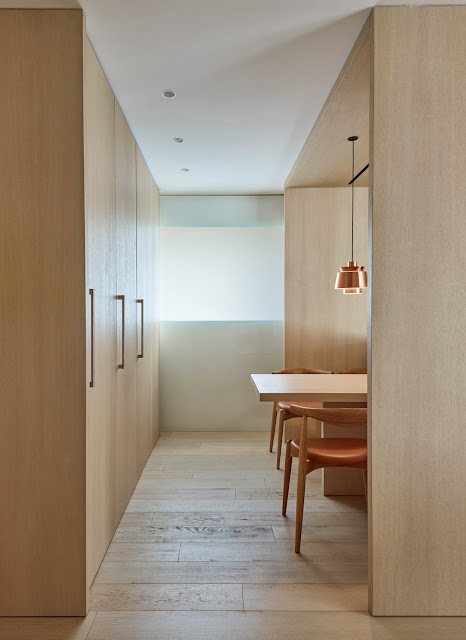 Located in the upper area of Barcelona, the identity of this apartment was conditioned from the beginning by its shape: a square plant with a façade completely open to the outside. Its design is divided into two main areas. 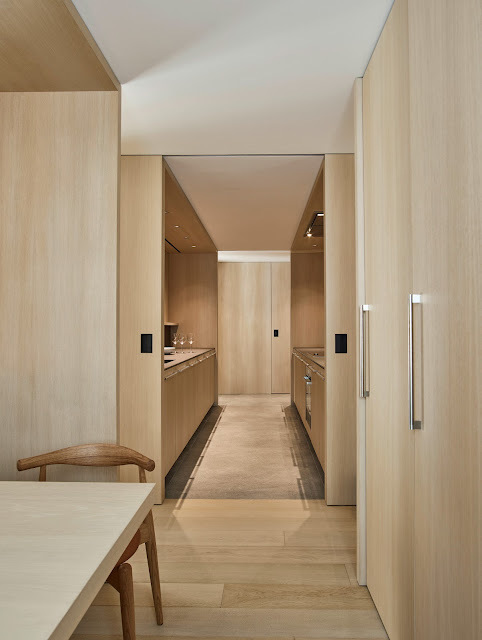 On the one hand, the opaque zone is dedicated to the bedrooms and the two entrances (both the main and service). 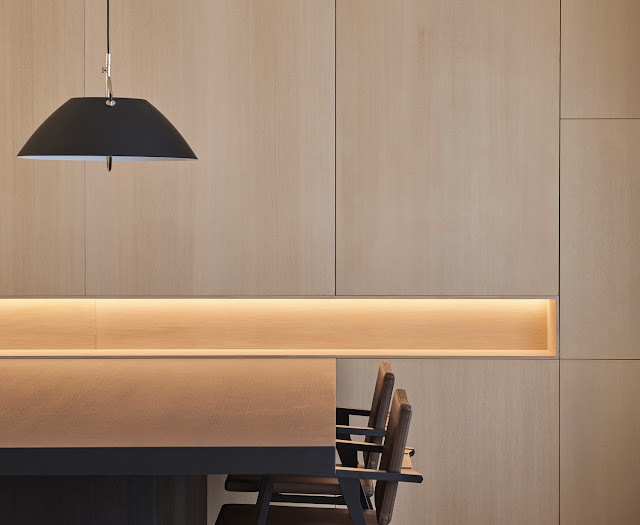 In the day zone, where is located dining room, kitchen, living room and terrace, the expressiveness of the space comes through the light. 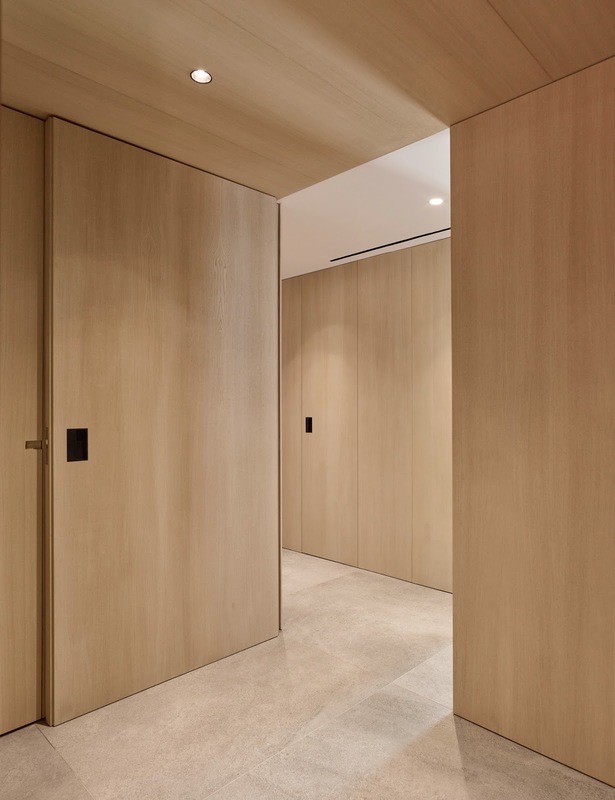 The entrance serves as a preamble to the apartment, where the main pattern is the open spaces and a transition area is required. From the central access is established the separation of the two great blocks whose dialogue will depend on a mobile panel system. 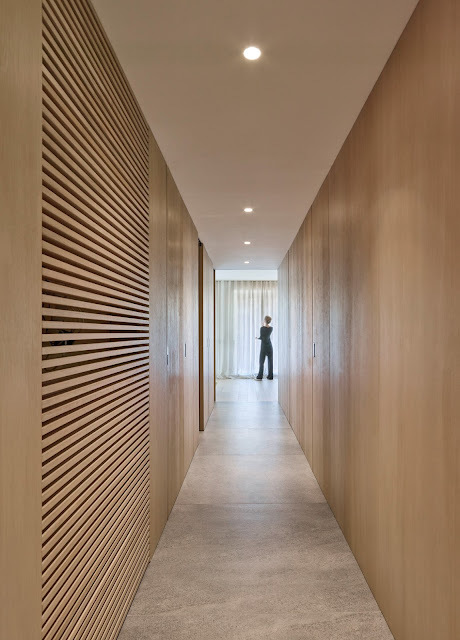 The L-shaped corridor hides a courtesy bath and connects the different environments through a system of sliding doors. 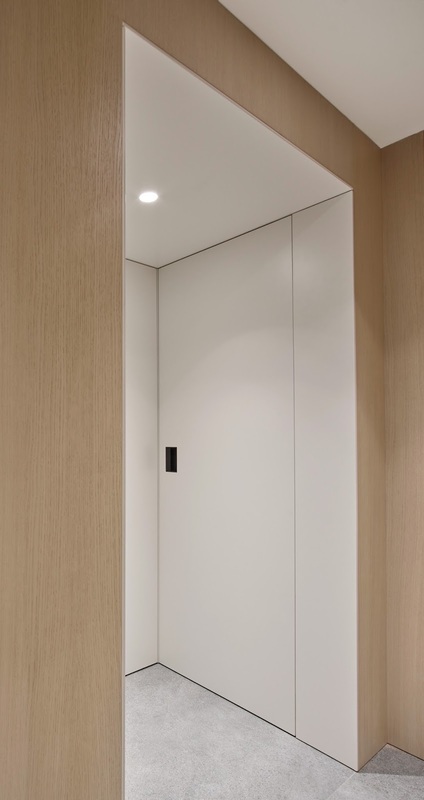 This enclosure system, which go unnoticed, work more like mobile walls than doors. 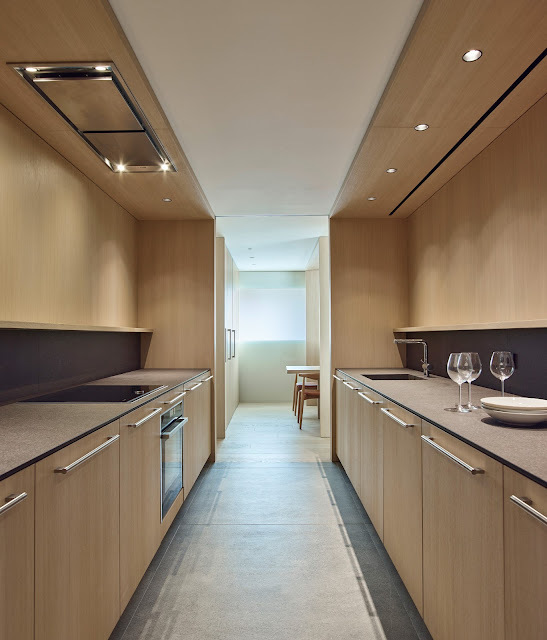 The kitchen hides a set of geometry and volumes designed as a box inside another. 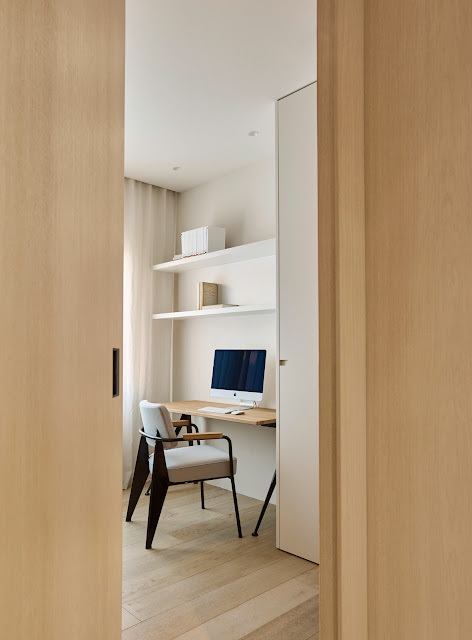 With double access it is presented as a fluid and flexible space that through another large mobile element can be or not independent from the living room. 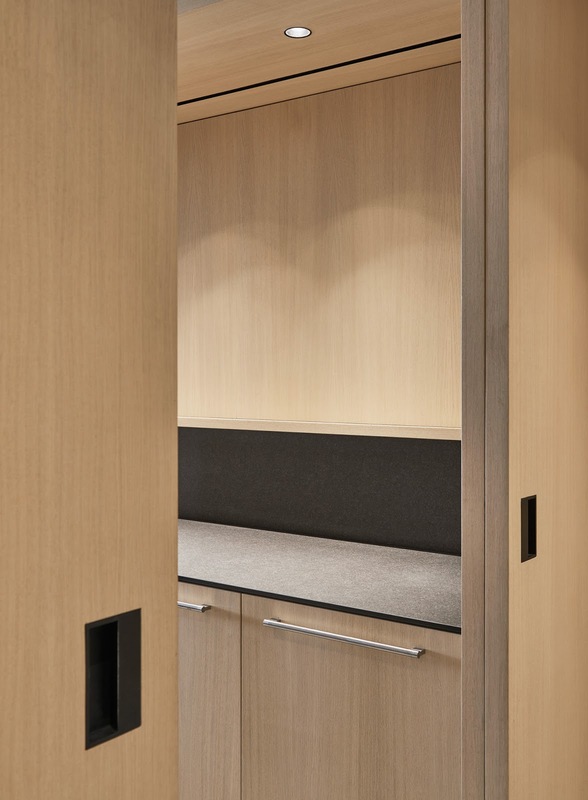 This area of ​​connection and disconnection hides a service room and laundry, while camouflaged in the coating itself is integrated a translucent window that lets the light through. 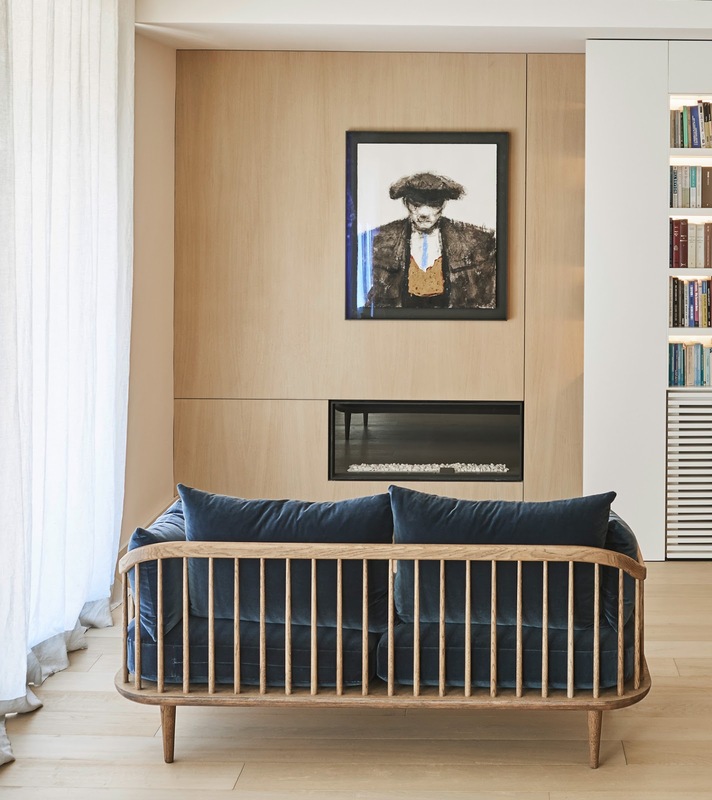 The living room is distributed in three areas: the dining room, delimited by a large table in black oak; the living area, facing a terrace projected in ipe wood; and a side space that integrates library, fireplace and a sofa by &Tradition. 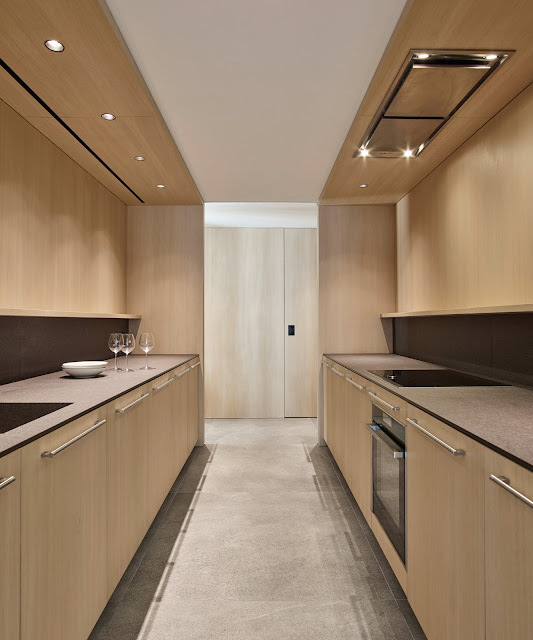 A project expressed in oak wood (enclosures, pavements and partial ceilings) subjected to a desaturation treatment in search of a more neutral color. 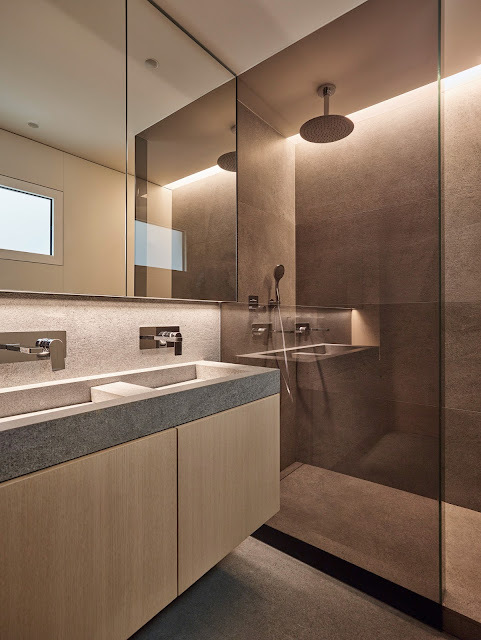 In support of this material it has been used porcelain stoneware in grey tones also used in bathrooms and kitchen countertops. 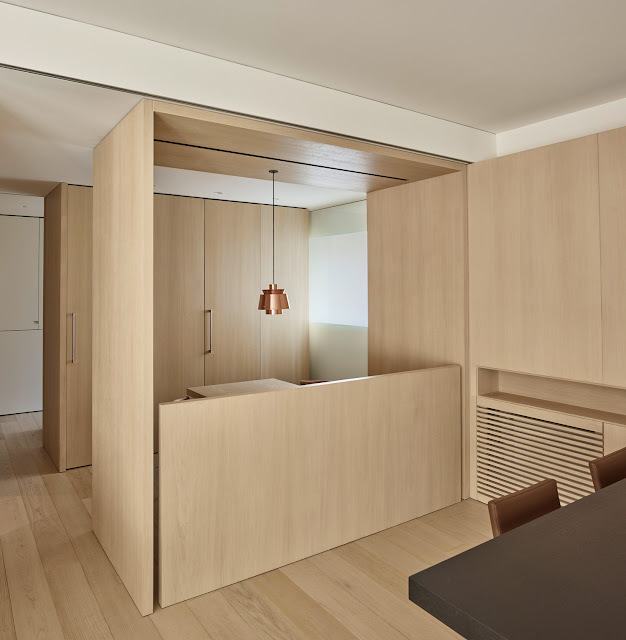 In the night area, distributed in four bedrooms, wood is the main material. A shelf has been designed in the master bedroom to integrate a boudoir and longitudinally delimit the window.